A stack of unfinished work sat on my desk, demanding immediate attention. Outside, the roads were icy and the skies a steel gray. A blustery north wind made the cold day feel even more unforgiving. I quickly changed into steel-toed boots and grabbed my personal protective equipment (PPE) bag. Not knowing what would be needed initially, I recruited a newly hired project manager to assist. Moments later, we were on our way to the building. The one-hour request was met. Such is the nature of disaster response. Disaster response is a service that can be hectic, frustrating, adventurous, dangerous, and immensely satisfying. In many ways, it gives literal meaning to the term “getting your hands dirty.” Upon arrival at a site, Terracon’s disaster response team always sees a building in its worst condition. Typically, all utilities have been shut off. Unsafe physical and environmental conditions could be lurking anywhere. Poor lighting is usually present. Working in confined spaces could be necessary. Further damage can quickly develop. Hence, all safety procedures and protocols must be followed. Depending on the situation, this could involve the use of respirators, Tyvek suits, personnel fall arrest systems, air monitoring equipment, etc. However, the most important asset personnel can have is a sense of awareness of their surroundings: if conditions appear to be unsafe, Terracon will not proceed any further until conditions are stabilized to our satisfaction. “Disaster response” as a service offering has been around for some time. Many of Terracon’s employees have worked on disaster response-related projects individually and collectively on an ad-hoc basis through the years. In recent years, Terracon has officially incorporated disaster response into its line of services. Disaster response projects require a firm with a large number of resources and wide variety of services, a perfect fit for Terracon. A certain amount of “murkiness” remains about what exactly disaster response is. It can include emergency inspections after an event, acting as a liaison for a building owner with governmental authorities, determining extent of damages, determining/designing appropriate repairs, strength testing of damaged and undamaged structural elements, sampling/testing of suspect materials, and developing protocols for remediation or mitigation of various environmental conditions. Disaster response is not a First Response at the time of an emergency or disaster. Government entities and companies specifically established for such purposes are first responders. Terracon personnel will only mobilize when requested by a client. Another misconception is that disaster response is only relevant in times of significant, noteworthy events such as a hurricane or large tornado. Many think this because in recent years, disaster response has coordinated services in the aftermath of Hurricane Katrina in 2005; the 2008 floods in Cedar Rapids, IA; the 2010 floods in Nashville, TN; the 2011 Joplin, MO, tornado; and the 2013 tornadoes in Moore, OK, to name a few. These were all severe situations that involved many square miles of destruction, but disaster response can also encompass a small event where a single building is damaged. In the case of the incident that is described at the beginning of this article, a late winter storm dumped 10 to 12 inches of heavy wet snow on the Kansas City area. 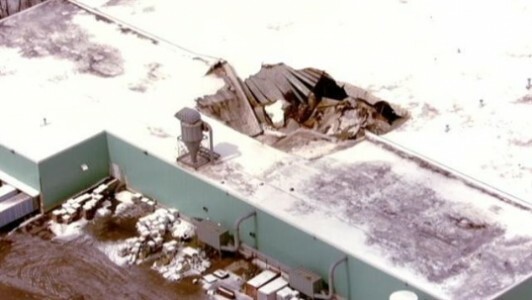 The building was a warehouse and manufacturing facility where the snow drifted against a parapet wall and overloaded the roof structure on one side, ultimately causing the roof to collapse at this area. While the roof collapse damaged a relatively small portion of the overall structure, the entire building was deemed unsafe by the City of Kansas City until Terracon could perform an evaluation of the building in its entirety and issue a report of findings. This report was completed within 24 hours of our assessment. 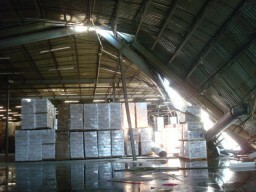 The report indicated the limits of the unsafe area inside the building. The report allowed the City to immediately issue a demolition permit for the damaged area and also allowed for partial building operations to resume. Due to our initial involvement, Terracon was then asked to design the appropriate structural repairs to the building and produce drawings suitable for construction permitting. Who are disaster response clients? Typically, they are contractors, building owners, and insurance companies. On occasion, they can be other design professionals such as architects who are responsible for coordinating the design of repairs. Most are groups and companies with whom we already work on other projects. Terracon’s four service lines – Environmental, Facilities, Geotechnical, and Materials Testing – are all necessary for effective disaster response. Case-in-point is the cited Kansas City project. After completing the initial structural assessment of the building and determining which portions of the structure required repair and replacement, Terracon’s Materials Testing group was utilized. Ground penetrating radar (GPR) tests were performed to determine the sizes of existing footings. We found that the existing footings where the building was to be re-constructed were of sufficient sizes to support the new superstructure. This resulted in a significant construction cost savings since the existing footings did not have to be removed and replaced. Had the footings been undersized, Terracon’s Geotechnical group stood ready to perform the necessary analysis that would have been required for new footings. During reconstruction, special inspections as directed by the City of Kansas City were conducted by Terracon’s materials testing professionals. This scope of work included inspections at the steel fabrication facility, anchor bolt installation, field bolting, and welding. Verification of steel members and open web bar joists was also performed. No matter what a particular disaster response might require, our clients appreciate the fact that with one call, they are gaining access to a myriad of answers through our consulting services. This is comforting to anyone who is confronted with such an overwhelming situation. For us, it is personally and professionally satisfying to be of service when the need arises.